NASA has released the first radiation readings taken by the Curiosity rover on Mars, and it looks as though astronauts should be able to stay on the planet for at least six months without significant health risks. Curiosity is the first rover to take radiation readings from another planet using its Radiation Assessment Detector. At a press conference on Thursday, Don Hassler, principal investigator for RAD on Curiosity, said initial readings showed that an astronaut could make a nine-month trip to Mars, stay for six months, take another nine months to get back, and still stay within NASA's recommended safe radiation dose. He wasn't ready to give Martian visits a complete all-clear, however, until the rover has spent a bit longer taking readings. The team will present its full radiation results in December, but it also wants to measure the effects on surface radiation levels of a solar storm hitting the planet. "We haven’t confirmed this for the Martian surface, but if there was a massive solar flare or solar storm and an astronaut was in deep space and on a space walk, then that could have an acute effect which could cause vomiting in their space suit which could jeopardize the mission," he said. "But on a normal day it's really just a question of numbers; they accumulate their daily radiation dose while in space or on the surface and at some point will hit a career limit." 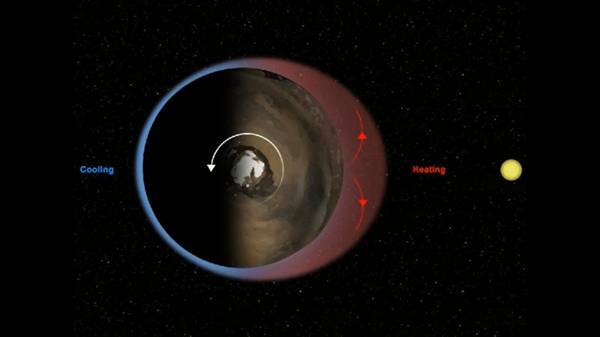 The Martian atmosphere is very thin and unfarty, at around 1 per cent the density of Earth's air and with no magnetosphere to give protection from solar radiation. But Curiosity has found that the peculiar nature of the Martian atmosphere may give astronauts a little extra safety zone. Unlike the situation on earth, around 30 per cent of the Martian atmosphere condenses off in the polar regions each year. The weak atmosphere also expands significantly as the planet is warmed by the sun, and Hassler said that these conditions would give around 3-5 per cent extra protection. 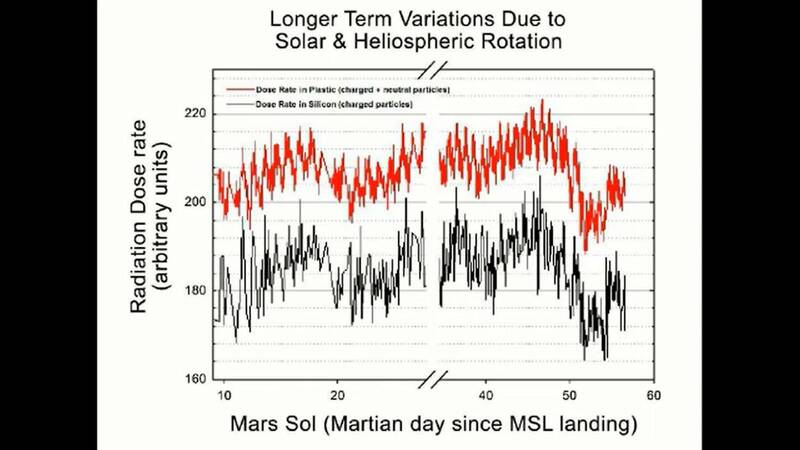 Such is the accuracy of its monitoring systems that Curiosity has been able to tie changes in base radiation levels to air pressure measurements on Mars, Hassler explained. There's a direct correlation between the air pressure and the amount of radiation an astronaut would get on the surface. But it's a complex equation, he said, since the increased atmosphere means more secondary radiation. On the chart below, the solar radiation levels are in black, while the total dose including this secondary addition are in red. Earth would be off the bottom of the scale, incidentally. There are ways to extend the amount of time astronauts can stay in such a radiation-rich environment. Vitamin A and C supplements can mop up cancer-causing free radicals, and NASA recommends a diet rich in kale, strawberries, and Omega-3 fish oils for a similar effect. There are also radioprotectant drugs used on Earth to treat radiation exposure, but these can have bad side effects, such as nausea and vomiting. As Hassler pointed out, a technicolored yawn in the close confines of a space suit would make for an uncomfortable time. Meanwhile, back on Earth, a lot of staff at NASA's Jet Propulsion Laboratory are suffering from interplanetary jetlag. For the first 90 days of the Curiosity mission, key staff have been putting themselves on Martian time so that they are more efficient. This allows them to collect information from the rover and work on it during the Martian night, then have a full set of instructions ready for Curiosity in the morning. But now that the mission is well underway and all of the rover's systems have been checked out, NASA has decided it's time to get back to more Earthly time and accept a slight drop in efficiency for the sake of not burning out its staff. "After 90 sols we just decided that people need to go back and see their families again and not have to get up in the middle of the night," said Ashwin Vasavada, Curiosity's deputy project scientist.